TORONTO, Nov. 20, 2017 (GLOBE NEWSWIRE) -- Nevada Zinc Corporation (“Nevada Zinc” or the “Company”) (TSX-V:NZN) is pleased to announce the first cored drill hole assay results from its 13 hole core drill program recently completed at the Company’s Nevada based Lone Mountain Zinc Project. Results for 11 of the confirmation and step-out core drill holes are pending. The Company’s drill program is the first core drill program completed on the Lone Mountain Zinc Project since the 1940s and follows up on the Company’s 83 reverse circulation drill holes completed between 2014 and 2016. Core hole assay results from NLM-17-01 include a 16.62 metre (54.5 foot) interval assaying 12.79% zinc and 8.84% lead (21.63% zinc + lead) within an overall interval of 91.5 metres (300 feet) grading 7.67% zinc and 1.93% lead (9.58% zinc + lead). Hole NLM-17-01 twinned the original RC drill hole (NLM-14-01) at that location. The RC drill hole intersected an interval of 89.92 metres (295 feet) assaying 6.22% zinc and 1.34% lead (7.56% zinc+lead). Drill hole NLM-17-01 provides important comparative assay information as well as geological data that will be used in the Company’s continuing analysis and future reporting. The average grade of core hole NLM-17-01 is a significant 26.7% higher than the average grade in RC drill hole NLM-14-01. Core hole assay results are still pending for 11 additional holes. The top of the mineralization in core hole NLM-17-01 is at a vertical depth of approximately 100 metres. The overall 91.5 metre interval in hole NLM-17-01 included approximately 15.24 metres (50 feet) of areas with little or no core recovery that were included at zero grade in the interval average thereby reducing the overall reported average grade. Hole NLM-17-02 intersected 18.3 metres (60 feet) of mineralization grading 4.6% zinc approximately 25 metres behind (to the northeast of) the intersection in RC hole NLM-16-64, one of the deepest holes on the Lone Mountain property. Hole NLM-17-01 drilled at -70 degree dip, 180 degrees azimuth and hole NLM-17-02 drilled at -88 degrees dip and 120 degrees azimuth. The Company has completed 83 reverse circulation drill holes on its Lone Mountain Zinc Project and recently completed an initial 13 hole diamond drill hole program on the property. Results from the RC drilling programs showed numerous broad intervals of medium to high grade non-sulphide zinc mineralization in two locations both of which are located between surface and a depth of approximately 250 metres. Generic Gold is a Toronto based mining company exploring targets in the Tintina Gold Belt in the Yukon Territory of Canada. Since incorporation on May 30, 2017, Generic Gold has raised approximately $2.4 million to fund its 2017 and 2018 exploration programs and has completed diamond drilling on its Livingstone project, trenching on its VIP project, and has commenced reverse circulation drilling on its Goodman project. Generic Gold is currently pursuing a going public transaction which is expected to be completed within the next 45 to 60 days. Nevada Zinc currently owns 25 million common shares of Generic Gold or approximately 75% of the issued and outstanding common shares. For further information on Generic Gold’s property portfolio and exploration activities please visit the company’s website at genericgold.ca. Toronto, Canada November 16, 2017- Nevada Zinc Corporation (“Nevada Zinc” or the “Company”) (TSX-V: NZN) is pleased to announce that majority owned Generic Gold Corporation (“Generic Gold”) has provided the Company with an update on the exploration activities completed at its VIP Project, approximately 120 kilometres south of Dawson City and west of Goldcorp’s Coffee Project, Yukon Territory. The Company owns 25 million shares (approximately 75% of the issued and outstanding shares) of Generic Gold. The 2017 field program was the most comprehensive work program completed on the 17,500 hectare VIP Project since 2010 when the Company acquired most of the property (prior to the Kaminak discovery of the Coffee gold deposits). The work completed during the 2017 field season consisted of trenching, soil sampling, prospecting, geological mapping, and geoprobe sampling. President and CEO of Nevada Zinc, Bruce Durham commented: “VIP was the first and top priority property in our initial Yukon portfolio. We were acquiring the VIP claims before Kaminak announced the first Coffee Project diamond drill hole results so we were in the Coffee Creek district very early. 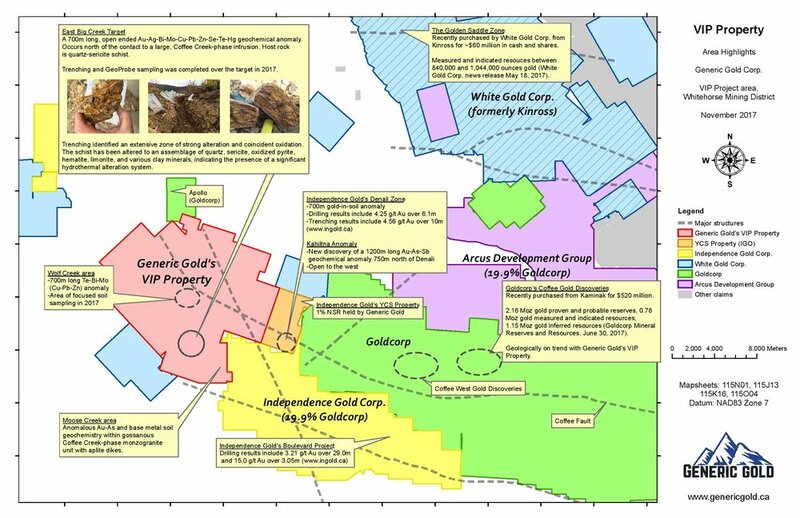 I am excited to see that Generic elected to carry out a significant work program on VIP this summer and we are anxiously awaiting the assay results from their work given some of the similarities in the recently trenched material at VIP and the original geological commentary on Kaminak’s Coffee gold discoveries”. The VIP project covers an area of roughly 17 x 13 kilometres, located 120 kilometres south of Dawson City, and is accessible by helicopter, nearby fixed wing aircraft airstrips, and nearby barge ports along the Yukon River. The project is in the White Gold district, approximately 20 kilometres west of Goldcorp’s Coffee gold deposits (2.16 Moz Au P&P Reserves, 0.78 Moz Au M&I Resources, 1.15 Moz Au Inferred Resources (Goldcorp Mineral Reserves & Resources, June 30, 2017), along the interpreted extension of the Coffee Creek fault system. The VIP Project is also contiguous with Independence Gold Corp.’s Boulevard property, Goldcorp’s Apollo property, and White Gold Corp.’s recently staked Coffee Trend West properties. Four trenches were dug by a heli-portable excavator in the area of the Big Creek anomaly. Due to more permafrost than expected and variable topography, the trenching focused on a portion of the northern margin of the interpreted 700+ metre long northwest trending Au-Ag-Bi-Mo-Cu-Pb-Zn-Se-Te-Hg anomaly. Forty-six geoprobe samples were drilled across the Big Creek anomaly at 5 metre spacings. The geoprobe drilling was done to penetrate through permafrost that limits the effectiveness of soil sampling, in order to test the uppermost portion (approximately 10 centimetres) of bedrock and basal soils. Oxidized rock and soil material was intersected over 130 metres (26 of 46 samples) crossing the Big Creek anomaly. Generic Gold was incorporated pursuant to the Business Corporation Act (Ontario) on May 30, 2017. Generic is a Toronto based mining company exploring targets in the Tintina Gold Belt in the Yukon Territory. Since incorporation, Generic Gold has raised approximately $2.4 million to fund 2017 and 2018 exploration programs and has completed diamond drilling on its Livingstone project, trenching on its VIP project, and has commenced reverse circulation drilling on its Goodman project. Genric Gold is currently pursuing a going public transaction which is expected to be completed in the next 45 to 60 days. For information on Generic Gold’s property portfolio and exploration activities, visit the company’s website at genericgold.ca or contact Kelly Malcolm, President and CEO, at kmalcolm@genericgold.ca or 647-299-1153. While the Company continues to maintain a significant interest in the highly prospective Yukon gold properties through its majority ownership position in Generic Gold, the current focus of the Company is the exploration and advancement of the Lone Mountain Zinc Project comprised of 224 claims covering approximately 4,000 acres near Eureka, Nevada. The Company has completed 83 reverse circulation drill holes on the property and has recently completed a 13 hole diamond drill program. Results from the RC drilling programs have shown numerous broad intervals of medium to high grade non-sulphide zinc mineralization in two locations both of which are located between surface and a depth of approximately 250 metres. Initial diamond drill core assay results remain outstanding at this time, however, assay results are expected to be received commencing prior to the end of November. In addition the Company has recently expanded its project portfolio by acquiring the rights under an option agreement to earn up to an 80% interest in the MacBride Zinc Project in northern Manitoba (see the Company’s press release dated October 23, 2017). Toronto, October 23, 2017 – Nevada Zinc Corporation (“Nevada Zinc” or the “Company”) (TSX-V: NZN) announces it has entered into an option agreement that allows the Company the right to earn up to an 80% interest in the MacBride zinc property (the “MacBride Property”). The MacBride Property, located in central Manitoba, contains the high grade MacBride zinc deposit located along a six kilometre structural magnetic high corridor. Along this well defined magnetic high corridor, several additional untested electromagnetic (“EM”) airborne anomalies similar to the EM signature of the MacBride zinc deposit have been identified. The MacBride Property is located approximately 60 kilometres from the significant, Ruttan zinc-copper mine owned by Trevali Mining Corporation (former open pit and underground mine). Given the propensity for these volcanogenic zinc and copper rich massive sulphide deposits to be found in proximity to each other and the history of discoveries in the belt, the Company views the MacBride zinc deposit as having very high potential for additional discoveries. The MacBride Property is comprised of 22 contiguous mining claims covering an area of 4,992 hectares 45 kilometres north of Leaf Rapids, Manitoba and the MacBride Property is reasonably accessible. The MacBride Property covers the favourable volcanogenic massive sulphide stratigraphy for more than 15 kilometres. Historical estimates of grade and tonnage in this press release are viewed as reliable and relevant based on the information and methods used at the time. However, they were not prepared in compliance with resource definitions under NI 43-101 and must be considered only as historic resources. Neither Nevada Zinc nor its Qualified Persons have done sufficient work to classify the historic estimate as a current mineral resource under current mineral resource or mineral reserve terminology and the Company and its QP are not treating the historic estimate as a current mineral resource. The historic resource should not be relied upon. Additional work including surface geophysics, drilling and bore hole geophysics will need to be completed to upgrade the historical resource to current NI43-101 standards. Near surface drill holes include results of 9.98% zinc and 0.56% copper over a core length of 10.67 metres (depth approximately 25 metres). True width of the zone is unknown. Deeper drill holes (near a vertical depth of225 metres) include an interval of 10.3% zinc over a core length of 11.19 metres. True width of the zone is unknown. Mineralization appears to be open to significant expansion along strike and the mineralization also remains open beyond the depth of the deepest drill holes. Processing of the available recent geophysical database shows the existence of numerous similar untested targets. Manitoba is an excellent jurisdiction with a strong local history of zinc and copper mining (Lyn Lake Manitoba area). Lack of local surface exposure means only shallow or exposed mineralization was tested historically. Newly identified outside targets remain untested and exhibit conductivity characteristics virtually identical to MacBride zinc deposit’s electromagnetic response. Scattered copper and gold mineralization located outside the MacBride zinc deposit area near other targets was reported in some historic work on and in the area of the MacBride Property. The MacBride zinc deposit, discovered in the 1970’s, has seen only limited drilling and has not been subjected to an extensive, systematic, exploration program. The MacBride zinc deposit is within the same Paleoproterozoic-aged metavolcanic rocks and interbedded meta-sediments as those that host the historic Ruttan copper-zinc mine. The MacBride zinc deposit coincides with a 1.8 kilometre long, strongly conductive, EM anomaly feature hosted within a well defined extensive magnetic high corridor that is more than six kilometres long. The deposit has been drilled along a strike length of approximately 275 metres and the remaining 1,550 metres of the EM anomaly remains untested. The MacBride zinc deposit remains open along strike and at depth. There are numerous similar conductive EM anomalies that have been identified in reprocessing of a modern airborne geophysical survey along the magnetic corridor that remain undrilled. The MacBride zinc deposit mineralization consists of coarse pyrite in a matrix of pyrrhotite, sphalerite and containing blebs of chalcopyrite. The extensive recrystallization of the massive sulphides and incorporation of wall rock fragments in the deposit mineralization suggests significant sulphide remobilization. The gangue mineral assemblage is lightly disseminated with sulphides and is primarily comprised of amphibole, biotite, chlorite, sericite and garnet typical of wall rock alteration products in volcanic massive sulphide deposit terrains. Nevada Zinc, as optionee, has the right to earn an initial 70% interest in the MacBride Property by making aggregate cash payments to Rockcliff Copper Corporation (“Rockcliff”), as optionor, of $200,000 over a three year term commencing with a $30,000 cash payment and the issuance of 200,000 shares to Rockcliff within five business days from the closing date of the option agreement, as well as incurring total expenditures on the MacBride Property of $2,500,000 over three years. Minimum expenditures of $250,000 are required annually. Upon earning an initial 70% interest in the MacBride Property, Nevada Zinc can increase its ownership interest to 80% by making a $2,000,000 payment to Rockcliff. In the event either party has its ownership interest reduced below 10% its interest shall convert to a 1% net smelter returns royalty or a 0.5% royalty on those claims subject to a pre-existing royalty. Certain claims in the MacBride Property are subject to a maximum 2% net smelter returns royalty payable to the original property vendor, 1% of which may be purchased. The option agreement is subject to regulatory approval. While the Company continues to maintain a significant interest in the highly prospective Yukon gold properties through its majority ownership position in Generic Gold Corporation, the current focus of the Company is the exploration and advancement of the Lone Mountain zinc project comprised of 224 claims covering approximately 4,000 acres near Eureka, Nevada. The Company has completed 83 reverse circulation drill holes on the Lone Mountain property and is currently carrying out a minimum 12 hole diamond drill hole program on the property. Results in the RC drilling programs showed numerous broad intervals of medium to high grade non-sulphide zinc mineralization in two locations both of which are located between surface and about 250 metres depth. Initial diamond drill core assay results remain outstanding at this time, however, assay results are expected to begin to be received commencing in October. Trevali Mining Corporation website: Ruttan size – 82.8 million tonnes at grades of 1.37% copper and 1.63% zinc. Current inferred resource at Ruttan 19.75 million tonnes at grades of 1.17% copper and 1.47% zinc. Toronto, October 13, 2017 – Nevada Zinc Corporation (“Nevada Zinc” or the “Company”) (TSX-V: NZN) is pleased to announce that majority owned Generic Gold Corporation (“Generic Gold”) has provided the Company with an update on the exploration activities completed at the Livingstone Project, approximately 85 kilometres northeast of Whitehorse, Yukon Territory. The Company owns 25 million shares (approximately 75% of the issued and outstanding shares of Generic Gold). President and CEO, Bruce Durham commented; ”armed with sufficient funds to do the first drilling program ever in the Livingstone area, Generic Gold has really advanced the understanding of the bedrock geology of the Livingstone Project. This new information will help define the source of the large number of extremely coarse placer gold nuggets that have been found in the five high energy creeks that drain westerly across the Livingstone property”. The 2017 work program was the first time that core drilling was completed to test for gold in bedrock along the Livingstone Project’s 14 kilometre length. In addition, new claims were staked, soil sampling and prospecting were completed, and a comprehensive compilation and interpretation of existing company and government geophysical and geochemical data was completed. The Livingstone Project covers an area of roughly 14 x 4 kilometres, located 85 kilometres northeast of Whitehorse, and is accessible by a winter road, fixed wing aircraft, and helicopter. Five west-draining creeks, all of which have their headwaters on the Livingstone property, are known for having produced numerous multi-ounce gold nuggets, some of which still contain primary quartz vein and accessory mineral material. Placer mining has been occurring sporadically in the Livingstone area since 1898. In 2016, the Yukon Geological Survey flew a 4,226 kilometre airborne VTEM survey, which identified several target areas that the government (Colpron et al., 2017) indicates “define potential exploration targets for the source of placer gold in the centre of the Livingstone Creek area.” These target areas were further defined and refined through geological, geochemical, and geophysical work completed by Nevada Zinc’s geologists over the past 6 years. Completion of 8 diamond drill holes, ranging in depth from 81 to 212 metres, on three high priority targets for a total of 1,315 metres. Assay results have yet to be received and results will be released by the Company once they have been received and compiled by Generic Gold. o King zone: Five holes were drilled along the Big Salmon trend on a multiparameter target defined by gold-in-soil geochemical anomalies, ground-based IP geophysics, airborne VTEM geophysics, and prospecting. These holes were targeting a graphitic fault horizon from which bedrock grab samples returned values of up to 10 g/t gold and 4.9 oz/t silver from quartz vein material. o Chinook zone: Two holes were drilled along the Big Salmon trend on a multiparameter target defined by gold-in-soil geochemistry, ground-based IP geophysics, and airborne VTEM geophysics. These holes were targeting silicified metasediments that had returned anomalous precious metal values. o Kokanee zone: One hole was drilled on a target which was defined by gold-in-soil geochemistry and airborne VTEM geophysics. This hole was targeting an area of increased resistivity along a regional EM conductor. o Soil sampling was undertaken in the Kokanee zone area that had been identified as anomalous during previous work campaigns, which coincided with a strong and structurally kinked EM anomaly. Results were positive and showed a broad trend of elevated gold-in-soils, with a geochemical signature of Au-As-Co-Cr-Cu-Ni-Pb-Te-W-Zn which may be indicative of ultramafic-related gold mineralization. Highlights of the 2017 exploration program are shown in Figure 1. A total of 36 claims were added to the Livingstone Project claim package, expanding the total land holding to 192 mineral claims, or roughly 4,013 hectares. Two of the new claim blocks were staked at the headwaters of historical placer creeks, while one was staked along the extension of the Big Salmon trend EM anomaly. A common Earth model was generated through inversion and interpretation of all existing geophysical and geochemical data in the Livingstone area. This interpretation work was done by consultant Alan King of Geoscience North, a globally renowned geophysicist who was previously Chief Geophysicist for Vale Global Exploration. The Earth model assisted with drill targeting for the summer program, and also provided numerous targets for future exploration programs. Colpron, M., Carr, S., Hildes, D. and Piercey, S., 2017. Geophysical, geochemical and geochronological constraints on the geology and mineral potential of the Livingstone Creek area, south-central Yukon (NTS 105E/8). In: Yukon Exploration and Geology 2016, K.E. MacFarlane and L.H. Weston (eds. ), Yukon Geological Survey, p. 47-86. Generic Gold was incorporated pursuant to the Business Corporation Act (Ontario) on May 30, 2017. Generic Gold is a Toronto based mining company exploring targets in the Tintina Gold Belt in the Yukon Territory of Canada. Since incorporation, Generic Gold has completed diamond drilling on its Livingstone Project, trenching on its VIP Project, and will soon commence reverse circulation drilling on its Goodman Project. For information on Generic Gold’s property portfolio, visit the company’s website at genericgold.ca. Nevada Zinc has completed 83 reverse circulation drill holes on the property and the Company is currently carrying out a minimum 12 hole diamond drilling program on the Lone Mountain property. Results from the RC drilling programs have shown numerous broad intervals of medium to high grade non-sulphide zinc mineralization in two locations both of which are located between surface and a depth of approximately 250 metres. Initial diamond drill core assay results remain outstanding at this time, however, assay results are expected to begin to be received commencing in October. The Company has recently granted an aggregate of 700,000 stock options to certain directors pursuant to its stock option plan at an exercise price $0.23 per share and an expiry date of October 11, 2022.